Petal & Stem will take you on a journey into the wildflowers, a secret world between the vines, where insects dance amongst a flourishing ecosystem. . It’s all part of the bigger picture to protect our vines and keep pests away naturally. 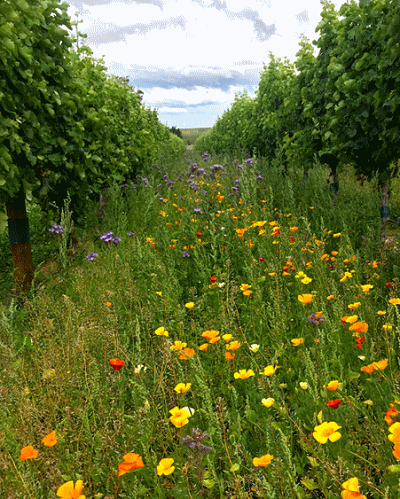 Every year we plant wildflowers between the vines to create a thriving little ecosystem amongst the rows. The wildflowers provide a home for the right kind of insects, who in turn help us keep the unwanted pests away from our vines. Not only do we attract predator insects to combat the pests, we also provide a place for bees and birds to thrive and reduce our carbon emissions through fewer passes with the tractor. By planting wildflowers between the rows we also help prevent wind and water erosion and improve water retention for our vines. So when you’re enjoying Petal & Stem wines, remember our little friends between the flowers who help us do things both differently, and beautifully. Sourced from New Zealand’s premier growing region, Marlborough, Petal & Stem wines embody the fresh natural acidity and succulent ripe fruit flavours that are typical of this globally renowned region, with its young, fertile soils and abundance of natural minerals. The range comprises of a Sauvignon Blanc humming with notes of passionfruit and grapefruit, a Pinot Gris buzzing with flavours of stone fruit and beeswax, a Rosé blossoming with scented peachy floral characters, and a Pinot Noir with a wild bouquet of lifted red cherry and cassis and hints of mocha and spice. (211 words). To discover more about Petal & Stem or to place an order, please contact your local distributor.